The time of the year for hot dogs and hot days. For many, it is also the time for reunions. Though it isn’t officially summer yet, our family scooted up the vacation schedule and gathered together early. I was blessed to be born into a wonderfully, big family and then I doubly blessed marry into a wonderfully, small family. In fact, I call these precious people my “in-loves”. Before heading out for an afternoon of fun together, my father-in-love took a few moments to gather together and call us to reflect on our lives. Being a sports enthusiast, he took the angle of a football game. What quarter are you in? He shared that each one of us are in a quarter of life. 0 – 25 years old, 26- 50, 50 -75 or 75 – 100. Being in the fourth quarter, he shared with us some of the highlights of God’s faithfulness in his life. My father-in-love practiced this verse from Psalm 78. He was telling his children the works God had done in his life so that they would in turn put their confidence in God. It’s not always easy to be bold with our kids. Especially as they grow older and develop opinions of their own, as parents we can easily slip into keeping the peace or not rocking the boat. But that is not what God calls us to do. 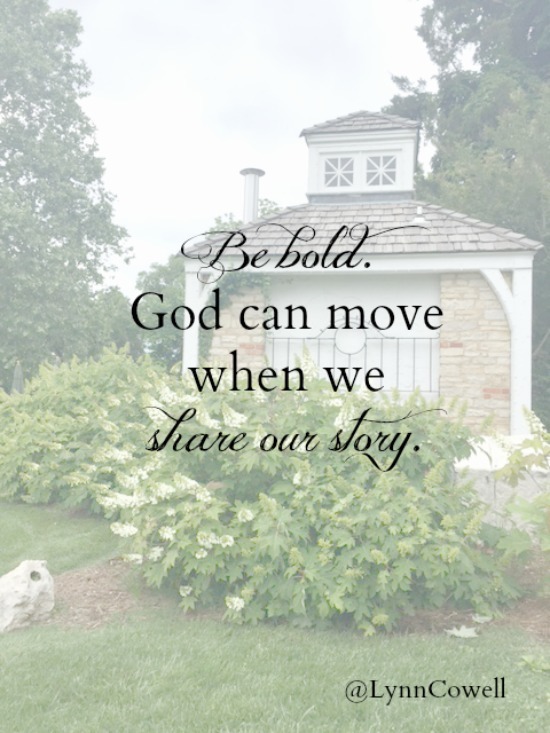 He tells us to tell our children all He has done and all He is doing because He can move when we share our story. For many, school is getting out soon. For me, it’s already here. One college student has moved home and one is soon to come. Be bold, friend. Don’t worry about what your children or grandchildren will think or how they will react. That’s up to God to handle. Just obey and see what He will do with your story. The winner of Suzie Eller’s new book “Come with Me” is Pat who commented on May 13th at 7:31 a.m. Pat, please email me at Lynn@LynnCowell.com and we’ll get this wonderful book sent out to you! Wow, Lynn! This really spoke volumes to me today. I began to open it earlier but knew as I was in a rush, wouldn’t have time to receive what God has for me, so I tucked it back in the unread puke of email. Boy am I glad I did. You always shoot straight to my heart. But doing this, is not giving her advice for her life, nor telling her what to do, how to solve, or how to live. It is simply recalling the goodness of God to me… to us. And leaving to God the results of that seed. Thank you for sharing this fourth quarter advice. Time to be bold with my half time talk! It is very hard, Lisa. Honestly, often for me what holds me back is the fear of rejection. I am asking the Lord to show me when to be bold, especially when their hearts are soft. Gotta love auto correct… Stack of email. Shoot! ? Well this is just what I needed to hear in my season of life right now I have one daughter that’s all in college and I have a baby that just came in the home so my life is pretty spaced out and I’m always going in busy with all three of my girls and I just need to hear that I know God has a plan for them it’s my job to just pray for them and guide them and give them wings and it’s his job to let them fly and become his children thank you so much Lynn for these powerful words! !